A man rushed past layers of security officers into a massive fire at the Burning Man festival's signature ceremony, suffering burns that left him dead just hours later. Authorities are investigating the death of Aaron Joel Mitchell, 41, who broke through a two-layer security perimeter during the Man Burn event in which a giant, wooden effigy is set ablaze. Nevada's Pershing County Sheriff Jerry Allen estimated that there was a crowd of about 50,000 people who were present when the festival's crew of firefighters pulled Mitchell out of the blaze. He was airlifted to the UC Davis hospital burn center in California, where he died Sunday morning. The sheriff said doctors confirmed Mitchell wasn't under the influence of alcohol, but a toxicology report is pending. "We don't know if it was intentional on his part or if it was just kind of induced by drugs. We're not sure of that yet," Allen said. Burning Man said in a statement that they had cancelled burns through noon Sunday but would go ahead with the 8 p.m. temple burn, another signature event that signals the end of the nine-day festival. More than 70,000 people are attending the art and music celebration in the Black Rock Desert, about 100 miles (161 kilometers) north of Reno. Organizers are also offering emotional support counseling on site, saying in a statement: "Now is a time for closeness, contact and community. Trauma needs processing. Promote calls, hugs, self-care, check-ins, and sleep." The festival culminates with the burning of a towering 40-foot effigy made of wood, a symbol of rebirth, which usually happens the Saturday before the Labor Day holiday. It's followed by the burning of a temple on Sunday before the festivities wrap up Monday. Attendees have tried before to run into the flames while the man is burning and there have been reported injuries from people trying to get a piece of the spectacle as a token and going through the hot coals. Allen said it's a problem that the organizers have tried to contain by having their own rangers stage a human-chain to prevent people from getting to the fire. Allen said that this is the first time someone has gotten through like this and the only fatality that he's aware of in his 15 years with the county. 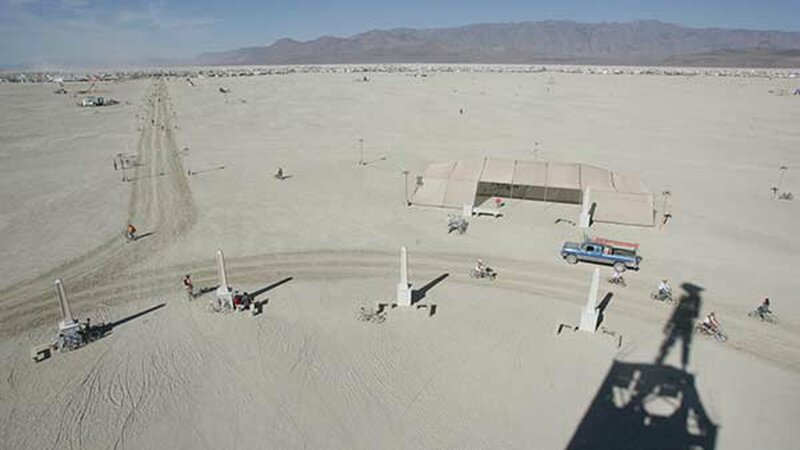 "People try to run into the fire as part of their spiritual portion of Burning Man," Allen said. "The significance of the man burning, it's just kind of a rebirth, they burn the man to the ground, a new chapter has started. It's part of their tenants of radical self-expression."